The emotional scope of Beck's discography is further broadened by Guero, which places his schizophrenic party music under a more solemn cloud. Think back to your first memories of Beck. Remember what he was like back in 1994? A floppy haired bohemian playing a leaf blower on stage. Rapping on MTV about being a loser, minutes after getting your attention with a single called "MTV Makes Me Want to Smoke Crack". See Beck on MTV's 120 Minutes with guest host Thurston Moore, giving nonsensical answers to every question during the interview, and then jamming with Moore and Mike D., using a mini-tape player and making bizarre sounds. Hear Beck singing about Satan giving him a taco. Think of him doing an old-fashioned folk-blues song one minute, sloppily rhyming over fuzzy hip-hop beats the next. Remember him stumbling his way into stardom, seeming like his whole career consisted of stumbling from one whim to the next, rolling along like a free-wheeling prankster. That Beck is no more. Somewhere between 1999 and 2002 something changed. A biographer might say that heartbreak was the cause. A sociologist might try to pin it on 9/11 and the country's declining optimism in its wake. Whatever the reason, 2002's somber Sea Change album made it clear that Beck was no longer in the mood for jokes. Though he had polished his music here and there, it was the first time that he seemed so earnest, so unplayful. 1996's Odelay offered a more cohesive, modernized version of the hip-hop flavored sound that made Beck a household name, but it was still eclectic and goofy. It was still fun. Midnite Vultures, Beck's "Prince album", was goofy and fun to the extreme. Three years later, on Sea Change, Beck sounded neither goofy nor fun. He was singing intently about feeling adrift, hurt and confused, to moody, rainy-day music. Guero is ostensibly Beck's return to fun. For it he reteamed with the Dust Brothers, who he worked with on Odelay. The album's opening track "E-Pro" begins with a loud guitar riff and funky drums which echo the feeling of a 1994 Beck song like "Soul Suckin' Jerk" or "Beercan", and uses a sample from a Beastie Boys song. The next track "Que Onda Guero" has a self-mocking Spanish chorus, a familiar-sounding hip-hop beat, and Beck rapping more straightforwardly than he has in a while. A cynic might accuse him of stepping backwards in time, of trying to get back to where he was when Odelay was on the Billboard charts. And the music of both songs give the impression that the tactic might work; they feel like his old hits made fresh again, given new energy and style. But keep listening, this isn't Odelay Part Two. Even those first two songs don't sound like retreads, for a key reason: Beck himself sounds different. Sea Change was a notable shift in tone for Beck. In place of the carefree, just-fooling-around Beck we got a serious Beck, with sadness lurking inside. It wasn't just the lyrics that were more serious, it was the way that he sang, even the tone of his voice. He stretched his words out more, sounded like he was carefully laboring over each syllable. On Guero he's not always singing as carefully, though he often is. But that tone has remained. There's a seriousness to many of the lyrics on Guero -- "E-Pro" is supposedly the return to happy dance music, yet it ends with the line, "There's too much left to taste that's bitter." Other songs find Beck feeling taunted by harsh memories, and anticipating death. But that isn't anything new. Even his earliest recordings were fascinated with death, discord and disappointment. But the tone and approach have changed; he's not inquisitively wondering about death, he's singing about feeling absolutely devestated and run-down, feeling like the end of the line is near. And even when the lyrics are playful, his voice has a solemnity to it which says that he's not just kidding around. 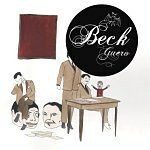 On one level, Guero is the quintessential Beck album, incorporating aspects of everything he's done. The music feels like the funky hip-hop-flavored pop music that everyone associates with him, yet there's also elements of at least some of the other styles of music in which he dabbles. "Missing" picks up on the bossa nova feeling which Beck indulged in on 1998's Mutations, "Black Tambourine" resonates with the echos of the lusty Prince jones that Beck exorcised so thoroughly on Midnite Vultures, and blues guitar pops up on tracks like "Broken Drum" and "Farewell Ride". Yet in tone these songs all carry with them the heaviness of Sea Change, whether it's right on the surface or buried inside the sounds of his voice. This is the changed Beck: even when he's having fun he sounds serious about it. There's sadness in his voice even when he's being playful. One of the lightest songs in tone, the melodic, sounds-like-a-hit "Girl", balances infectious, breezy music with Beck singing darkly about making his girl die, stealing her eye. As a nonconformist jack-of-all-trades navigating a path through the world of commerical pop music, Beck has always been nothing if not interesting. And if Guero's balance of the light and the dark makes it feel awkward at times, it also makes it one of Beck's most interesting albums. Sea Change felt so different not because Beck was dabbling in a different genre of music - any comprehensive look at his discography will reveal him to be hard to pin down, in terms of genre or style - but because he sounded so damn serious. By wedding that serious tone so completely with the sort of music that begged for terms like 'mature' and 'introspective", he made Sea Change an easy album to peg, easy to understand. Imagine that same seriousness blended with the funky, upbeat party atmosphere of some of Beck's biggest hits, and you have something more complicated. Guero finds Beck leaning towards a hybrid of his already hybrid-ized party music with his newfound solemnity. There isn't a clear balance towards the two; the sadder his songs get, the more he leans towards quieter, more melancholy sounds. But Guero's chief feat is re-presenting Beck's schizophrenic musical personality, but this time within the context of sheer heartbreak and loneliness. Unlike Sea Change, Guero is mostly dance music, but here we're dancing to death's call, dancing to the sound of a broken heart.